Our retractable screens were originally designed for the commercial and agricultural industries. They were used to provide a tough, durable screen that would keep pests out, while allowing fresh air to flow through buildings. Soon, demand for these screens began to grow. It wasn’t long before we were getting orders for retractable screens from restaurants, warehouses and homeowners throughout America and Canada. Our retractable screens are available in both manual and automatic versions. Why Choose Automatic Retractable Door Screens? Our Retractable Screen Systems are currently being used on garages, screen porches, patios, gazebos, warehouses, barns…you name it. The DuraScreens Automatic Retractable System is the affordable way to turn virtually any outdoor area into a cool, comfortable and pest-free sanctuary. DuraScreens Retractable Screens can be ordered different degrees of shade, including 72%, 92% or solid vinyl and solid vinyl with clear vinyl windows. 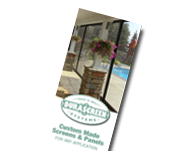 DuraScreens Retractable Screens are the only screen systems that are completely self-sealing. Our unique track design is what makes the retractable screen system possible. Heavy duty extruded anodized aluminum tracks are mounted to the side jambs of the opening. The screen rides within these tracks, preventing gaps and keeping the screen taut throughout its operation. Along the bottom rail sits a rugged, vinyl gasket that allows the bottom rail to mold itself to the contour of the ground. Our automatic designs feature a whisper-quiet motor that operates the screen at impressive speeds and is easily controlled by a handy remote control. It’s just like any common garage door opener, only quieter and with equal or greater speed. 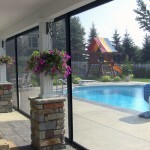 It’s easier than you think to get retractable screens for the doors in your home or business. Whether you’re looking to partially enclose a patio or add a screen to your garage, DuraScreens will work with you to affordably fit a screen for almost any outdoor area. Contact us today to learn more. Our Automatic Retractable Screens work with any kind of Door!